The Colorado Rapids College Placement Program (CPP) assists all players and their families with the college athletics recruiting process. Understanding that not all players will choose to continue to play soccer in college, there are still many benefits of this program that will be useful during a college search and admittance process. The program includes standardized test prep, admission and application information, communication development, and financial aid information. The College Placement Director’s role is to help parents and players navigate the college selection process through online resource guides, quarterly workshops, ACT/SAT test prep program, and assisting with College Fit Finder. 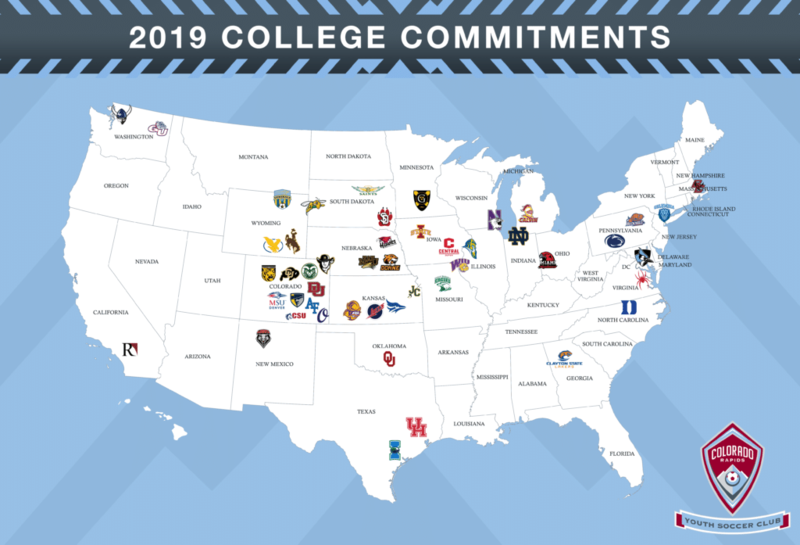 The College Placement Program will foster and develop relationships with university and college programs to create a consistent avenue for CRYSC players to achieve their goals of attending college and playing soccer. Anthony has experience as an Assistant Men’s Soccer Coach and Recruiting Coordinator for Regis University while also coaching for the Region IV Olympic Development Staff. Previous positions include the Real Colorado Edge Soccer Club’s CAP program, serving as a Technical Director, and a proven track record of placing players at colleges all over the United States from Junior College to Division 1. The College Placement program has 5 phases preparing our high school players for the college. College Fit Finder is an online resource that helps high school players and college coaches find the perfect fit. Players will create a customized profile detailing their information for coaches and scouts to see their information. The online portal allows players to share their game film, grade point average, position, club, and more so that every coach can see what you would bring to their team. Browse schools through College Fit Finder to learn financial information and team information to make educated decisions about where you would like to visit and who you would like to save to your shortlist. College Fit Finder is also an official college recruiting partner of United Soccer Coaches, World’s largest soccer coaches’ organization. Overall, it is crucial for our players to take an active role in finding their program whether they intend to play or focus on their studies. Meet with School Counselor/Advisor to evaluate your academic progress, core courses. Get a great start on your GPA. Stay organized and on top of all studies. Take “academic” electives — languages/mathematics/sciences. Consider ACT and SAT / PSAT study materials and/or tutoring services. Read the NCAA publication — Guide for the College-Bound Student-Athlete. Involve yourself in extracurricular activities — clubs/honors society/church group. Evaluate your soccer weaknesses and work on improvement. Meet with Coaches and create an action plan based on goals. Practice on your own — fundamentals and ball skills. Consider attending a college’s soccer summer camp or ID camp. In Colorado, there are many local options at Division I, II, III, NAIA, and NJCAA levels. Watch College Soccer Programs, Understand the level. Evaluate your academic weaknesses and work on improvement. Continue to improve on your GPA. Study. Study. Study.. Involve yourself in extracurricular activities — clubs/honor society/church group. Attend college soccer residential camps or ID camps. Practice Communicating with Coaches (email, letters, and phone calls). Meet with your guidance counselor to discuss your academic curriculum. Take “academic” electives — languages / mathematics / sciences. Retake classes to improve grades if possible. Take the SAT and ACT. Continue to take these tests. Scores will continue to improve. Use external resources, such as our partner The Sport Source, to improve test scores. Become familiar with the Financial Aid and Scholarship process. Start choosing schools — finalize your “wish-list”. Know your abilities and choose schools that “fit” your needs. Complete your core course requirements. Take the SAT and ACT again – scores will improve. Ask questions. This is to your club coaches, teachers, counselors, college coaches. You want to make sure you are 100% prepared. Become familiar with the “Scholarship” process. Become familiar with the “Financial Aid” process. Continue to participate in external programs. Continue to play at the highest level available to you. Know your Academic and Soccer abilities. Speak to your club coaches and directors. Be honest with yourself and your desires in college. It is important to make the right selection when it comes to choosing a college. Do not place too much emphasis on athletic scholarships. Depending on division, scholarships can be limited or non-existent. This is why it is so important to make sure your academics are in order. Does the school “fit” your needs? Will you be happy there? Without Soccer? Without the academic/social environment? Contact our College Placement Director about this process through the form below.